The 2010 ADA Standards for Accessible Design (SAD) went into effect on March 15, 2012. The goal of SAD is to harmonize the accessibility codes in the US and ensure the maximum level of accessibility for public facilities. For more information regarding ADA codes you can view the US Access Board’s site or visit the DOJ’s ADA site. Download the complete 2010 ADA Standards or view the signage section below. Signs shall comply with 703. Where both visual and tactile characters are required, either one sign with both visual and tactile characters, or two separate signs, one with visual, and one with tactile characters, shall be provided. Raised characters shall comply with 703.2 and shall be duplicated in braille complying with 703.3. 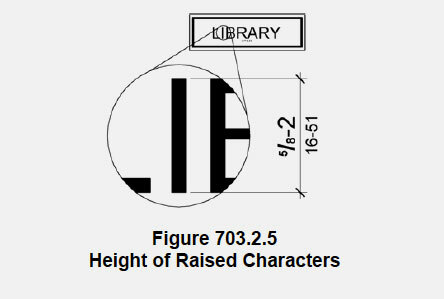 Raised characters shall be installed in accordance with 703.4. Braille shall be contracted (Grade 2) and shall comply with 703.3 and 703.4. 703.4 Installation Height and Location. Signs with tactile characters shall comply with 703.4. Pictograms shall comply with 703.6. Symbols of accessibility shall comply with 703.7.